Guild Mid-Week Tours hit 250! FSG ORIGINAL MINUTE BOOK FOUND!! COVERS PERIOD 1909 - 1924. Steve Bowley, Guild Ringing Master, received a most interesting email in June. The writer said a colleague had the FSG Minute Book dating from 1909, and would the Guild like to have it. Steve replied that we would very much like to have it. He arranged to meet the writer at the local practice, near Swindon, and returned home that night with the book. 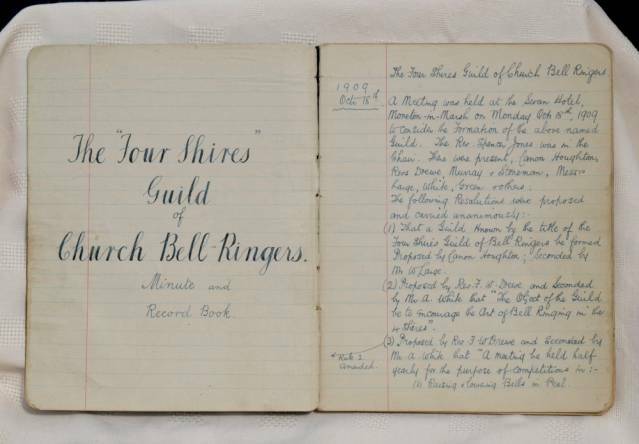 A quick look through revealed it ran through from the very first meeting to 1924, a total of 110 pages filled with the earliest of Guild history. A real treasure trove! Should anyone think the present-day Guild has the wrong name, don't worry. 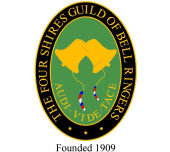 The middle of the right-hand page carries the important words: 'That a Guild known by the title of the Four Shires Guild of Bell Ringers be formed. Proposed by Canon Houghton; Seconded by Mr W Large'. No name-changing required. There from Day1! Read the article "The Guild Minute Book 1909-1924".